Clarks is a popular shop that sells men's, women's, and children's shoes. Bargain hunters enjoy shopping at Clarks, especially in the online sales. In January, it tends to have up to 50% off, and in the run-up to Black Friday it also has big bargains. It is known for its classic range of shoes both for work and casual wear. You can often stack deals with a Clarks discount code for an extra saving. Clarks, a trading name for C. & J. Clark International Ltd., was founded by the Clark brothers, Cyrus and James in Street, Somerset, England. The company’s headquarters is still located here to this date. This UK-based company has more than 1,000 branded stores and franchises all over the world under its belt. The company boasts of a rich legacy. In fact, during the Second World War, its factory housed the missiles of the Allied Forces. Clarks seasonally launch new products, but up to now its ankle height Desert Boot is still the heart and soul of the company. This boot, designed by James Clark’s great grandson, Nathan Clark, is famous for its one of a kind crepe rubber sole that is typically crafted from calf suede leather. The design was based on the profile of an unlined suede boot manufactured in the bazaars of Cairo and worn by the British officers of the Second World War. Since its humble beginnings in 1825, Clarks has become a popular international brand of shoes synonymous with comfort and reliability. Ladies Shoes – browse through their latest collection of sandals, flat shoes, flat sandals, casuals, pumps, trainers, wedges, summer shoes and high heels that are made from hand-carved materials. 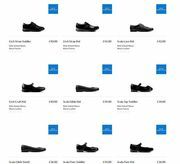 Mens Shoes – choose from their men’s collection of sandals, boots, casual, summer shoes, smart casual, trainers, black shoes, smart shoes, wide fit shoes, all style shoes and brogues. Kids Shoes – discover their new arrivals for kids which include all styles, school shoes, trainers, canvas, casual shoes, sandals and boots which comes in a range of styles and various sizes. Originals – features Clarks key styles with a wide range of silhouettes and hues. Boots – this catalogue features smart, contemporary and everyday styles of boots for any age or occasion. Mens Desert Boots – a selection of leather and suede Desert Boots which feature the company’s signature crepe sole. Wide Fit Shoes and Boots – browse their selection of contemporary, casual and formal styles of wide fit shoes, boots and trainers. Kids School Shoes – a collection of children’s school shoes that comes in whole and half sizes. Sandals – browse through the collection of sandal styles in on-trend colours. Bags – choices of work bags, smart bags, shoulder bags, clutches and wristlets for women and canvas, rucksacks, leather bags and wallets for men. How do I contact Clarks? For kid’s fitting appointments, you can book an appointment online. For further assistance, you can contact them at 0844 248 8408. Alternatively, you can contact them for any enquiries through the online contact form found on their website. If you have store service queries, you can contact their Customer Care team at 01458 899 901 every Monday to Saturday between 8:30am – 6:00pm and on Bank Holidays from 10:00am – 2:00pm. What are the delivery options for Clarks? £5.95 Next Day Delivery – order online or in store before 8pm for your item(s) to be delivered the next day from Monday – Saturday from 8am to 8pm excluding Bank Holidays. Free Collect+ Delivery on Orders Over £50 – order for free online in over 5,800 Clarks’ Collect+ locations within 3 to 5 working days. You can check out their Delivery and Collection for more information. Free Collect from Clark Store – order and pay online for free delivery of your item(s) at any Clarks store within 3 to 4 working days. For Channel Islands, it will take 7 to 10 working days. You can also find a Clarks store near you in their website. Clarks offer delivery to the USA, Europe and Australia form their international websites. How do I return an item to Clarks? Returns and deliveries of Clarks are free via Collect+, the Post Office and to the store. Via Collect+ - you can return your order for free to over 5,800 Collect+ locations. Make sure the prepaid label came with your parcel is attached. Via the Post Office - Make sure the prepaid label came with your parcel is attached. To the Store – for exchange or refund to a Clarks store, make sure you have your proof of purchase with you such as an Order Confirmation or invoice. Exclusions are Outlet, Discounts, Factory Stores, Wholesale and Eire. Kids Fitting Service – find the right fit for your kids through this service where a Clarks staff will measure their feet to get the best possible shoe fit. Kids Appointment Service – in store and website appointment system to book your kids Fitting Service appointment. Ordering Service – Clarks can order for you the size or colour of the shoes that you want which are not in stock. Odd Shoe Scheme – if you or your kids have different sized feet, Clarks offer odd sized pairs that you can purchase as a pair to fit both feet. A surcharge of 2.5 per cent applies for kids and 50 per cent for adults on top of the usual price tag of the shoes. Shoe Share - formerly known as Shoe Biz Charity Shoe Collections, Clarks encourages people to donate their old and unwanted footwear, which will then be sold in order to raise funds for different projects supported by the company. TAMBA Member’s Discount – TAMBA or Twins And Multiple Births Association members can receive around 10 per cent discount of full priced shoes and accessories for adults and kids. Simply show a valid TAMBA or IMBA membership card to get the discount. All collaboration ranges, shoe care products and Clarks Originals are not included in the discount arrangement.